On Monday, March 1st, 2010, at approximately 11:00 pm, Cst. Ochakovsky, while operating a marked police cruiser, was involved in a two-vehicle collision at the intersection of Airport Road and Steeles Avenue East. Cst. Ochakovsky was taken to Sunnybrook Health Sciences Center with critical injuries. Despite the hospital staff’s best efforts, Cst. 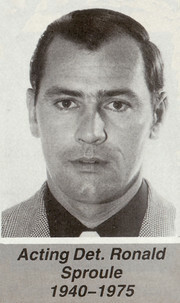 Ochakovsky succumbed to his injuries. On May 15th, 2004 at approximately 03:00 hours Constable Garrett responded to a call involving an alleged robbery. Constable Garrett met the alleged victim in the parking lot of the hospital and it is believed proceeded to take details of the incident. At some point during the taking of information, Constable Garrett was attacked with a knife by the alleged victim mortally wounding him in the initial attack. Constable Garrett, although fatally wounded, was able to remove his revolver and pursue and wound the attacker with what is believed to be his last round. It is known that the actions of Constable Garrett prohibited the assailant from carrying out any further carnage and undoubtedly saved the life or lives of both citizens and other officers. Cst. Rossiter was patrolling the street when he stopped to investigate a male cyclist on Oxford Street. A physical altercation occurred and Cst. Rossiter was shot in the head and killed instantly. 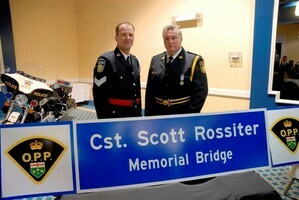 Late 2011, a dedication ceremony took place to unveil the sign that will be placed over Highway 401 at Highway 19, dedicated in memory of Cst. Rossiter. Members of the PRPA were there for the dedication. Constable Piukkala responded to a fictitious call at a residence on August 26, 1984. As he entered the premises he was attacked and stabbed to death. The culprit, following the attack, took the Constable’s service revolver and committed suicide. In recognition of his exemplary service the Peel Regional Police Services Board created the CONSTABLE DWAYNE PIUKKALA MEMORIAL AWARD. 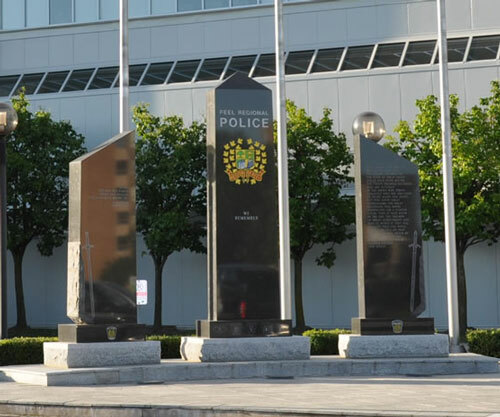 This award is designed to honour an officer with no more than five years experience, in recognition of an exemplary deed and/or continued excellence in the police field, demonstrating qualities and potential so highly valued by the Peel Regional Police. Detective Scheja was a passenger in a police cruiser operated by Detective William Hawkins when the cruiser left the road for reasons unknown and struck a culvert. Both officers were killed. Detective Bill Hawkins was operating a police vehicle with his partner Detective Voker Scheja.Cst. William Hawkins The vehicle left the roadway for reasons unknown and struck a culvert. Both officers were killed as a result of the collision. Detective Sproule was a passenger in a police cruiser when the driver of the vehicle lost control and the vehicle veered across the highway. The cruiser was struck on the passenger’s side by a van travelling in the opposite direction killing A/Detective Sproule. Constable Webster was on routine patrol when the cruiser he was operating was struck head on by a vehicle traveling in the opposite direction. At the time of the collision a transport driver was taking evasive action to avoid a vehicle turning in front of him and collided with the cruiser. No charges were laid in connection with the incident.